Should we be thinking more about recent strikes in Africa? It’s been just a month since platinum miners went on strike in Marikana, South Africa — and the police, in turn, unleashed deadly force, killing more than 30. Recent reports suggest that some of those killed may have been fleeing the scene. And as the Times reports today, this has unleashed a series of wildcat strikes across the country, which may be propelling labor unrest unknown since the apartheid days. The unjust police reaction to the Marikana strike has prompted various legal and political challenges, including by young firebrand Julius Malema. But I’ve been noticing that workers have been striking more and more in various African countries. For example in the health and education sectors in Botswana and Swaziland during the past couple of years. And a more thorough review of strike activity in Kenya suggests a growing pattern, as detailed below. If true — and more research might highlight that my characterization is a myopic one — we should be asking, what is going on, and what are the implications of strikes for growth, development, and equality? In countries where very large shares of the population are unemployed, formal sector workers occupy a strange position. On the one hand, they are still “labor,” and in many cases may well be receiving extraordinarily low wages on an international scale, poor working conditions, and lack any sense of job security. On the other, formal sector employees are typically very highly paid relative to most everyone else, and their actions may simply deepen inequalities while impeding productivity and investment. The workers at Marikana clearly met an unjust response for their demands… but they were demanding a take-home pay increase to about $1,500 a month, when the typical wages are one-half to one-third that amount. It’s too early to make any assessments of the impact of such strikes, but it might be an interesting dissertation topic to consider both the causes and/or consequences of strikes across space, time, and sector in Africa. Labor politics are sometimes considered old school, but with growing economic development across the continent, they could become increasingly important. What are the effects in terms of the distribution of income and the quality of service provision following such strikes? Who wins and who loses? One of the key claims of striking teachers has been that they are not paid enough to warrant the hard work expected – so one question is whether gains achieved from strike-induced collective bargaining lead to any increases in the quality of service? Or do they simply lead to a greater concentration of income? In the U.S., to read about the Chicago teacher’s strike from Randi Weingarten (American Federation of Teachers President) and Nich Kristof, who would normally be pretty sympathetic to the plight of organized teachers, one can be left feeling pretty confused about whether the strike is about education or protecting union members. Anyway, I throw this out, hoping it might spark some further research and discussion, and perhaps an interesting research project. Indeed, teachers have been striking for the past couple of weeks! They want a a 300% salary increase, plus allowances for housing, and medical care, which they say were promised to them under a 1997 agreement the government has failed to honor (Nation). 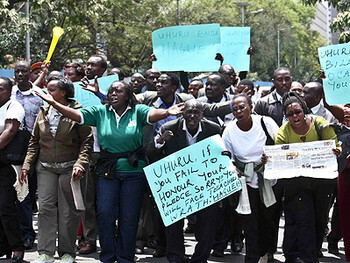 In 2011, the Kenyan teachers struck for 4 days, until the government conceded to permanently employ some of the temporary contract teachers (All Africa). And back in 2009, teachers walked out for 10 days over salaries (BBC). The previous strike lasted 10 days in December 2011, and the government agreed to hire more doctors and provide more money for training and equipment (All Africa). Nurses also went on strike in March 2012, government fired 25,000 health care workers for not showing up to work but later rescinded the dismissals as part of the deal that ended the strike (All Africa). But it’s not just public sector employees who have been striking. For instance, Kenya Airways just laid off 453 employees in an effort to reduce costs. The company says this was necessary partially because of concessions they had to make to the union in the 2009 strike, which KQ claims has made it too expensive to keep all these employees (Nation). And flower farm workers have gone on strike a few times – In 2006, it led to mass layoffs (Mail & Guardian). And in 2011, the strike was reportedly more about poor working conditions including sexual harassment, no sick days, losing their jobs if they are injured at work (All Africa). *Many thanks to Jessica Grody for even more assistance than usual on this post!